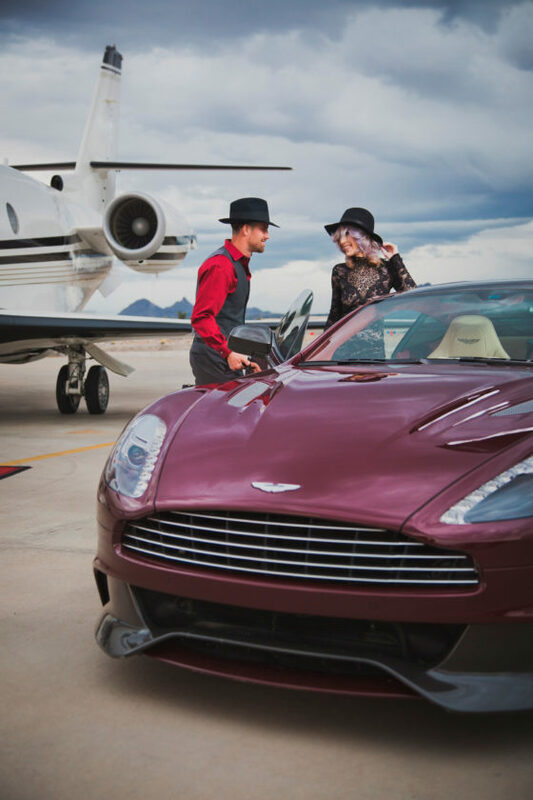 PHOTO SUBMITTED A promotional image for Watson’s Hat Shop shows two models wearing Eric Waton’s custom-made hats on a set with a private jet and an Aston Martin car that belong to two of Watson’s customers. PHOTO SUBMITTED Eric Watson poses in his store with shop dog, Derby. PHOTO SUBMITTED Watson’s Hat Shop is located at 7100 E. Cave Creek Road, Ste 148, Cave Creek, Arizona. GRAPHIC SUBMITTED The logo Watson’s Hat Shop. CAVE CREEK, Ariz. — Seneca County native Eric Watson, the nation’s youngest hat maker, is to be featured Friday night on INSP Network’s “Handcrafted America,” a national TV program. The 34-year-old entrepreneur, who makes hats in his Cave Creek, Arizona, shop is one of this week’s segments on the program which features top artisans from around the United States who hand-make their products. Filming took place in early October with about six crew members and host Jill Wagner. Filming took two days for a 15-minute segment. “It was a lot of work,” he said. “It’s always neat to experience things like that. “It’ll get the Watson’s Hat Shop name out. About 90 million people watch it,” he said. “I’m super excited about it because I know it’s really going to help business. Filming in front of cameras isn’t new to Watson. “I’ve been on TV before so I wasn’t too nervous,” he said. Last year, he was on an ABC’s “The List,” and he has appeared on “Front Page” with James Earl Jones. In total, he has been featured about 20 times in magazines, newspapers and on TV. Media attention has made Watson well known, first in Arizona and now nationwide. The series is to premier in 2017. GRAPHIC SUBMITTED The logo Watson's Hat Shop. The shop also has made hats for people such a country music singer Kenny Chesney and actor Justin Timberlake as well as Al Roker, weather anchor for NBC News. As business has grown, Watson has received recognition for his work. “One thing that’s kind of exciting is I was awarded the Small Business Spotlight Award,” he said. “It’s a small business award from Congress. Basically, the congressmen picked us because we have a strong community involvement and strong recognition from our customers. In 2015, he was one of 35 winners of AZCENTRAL’s 35 and Younger Award, which highlights young entrepreneurs. Watson’s decision to make hats stems from life circumstances and a childhood hobby that started in Tiffin. He was born in the old Mercy Hospital building and his family lived across from Genex bull farm on SR 18 during the first years of his life. The family moved to a house near Howard Collier State Nature Preserve not far from McCutchenville before settling into a house on the outskirts of McCutchenville. He attended the Mohawk school system before changing to Calvert High School, where he graduated in 2001. He graduated with a bachelor’s degree in international studies and diplomacy from Wright State University, Dayton, and from Sinclair College with a degree in aviation technology with professional piloting. He and Emily married at Dayton’s Carillon Historical Park in October 2008. The trail from training as a young pilot with a degree in international studies to making hats in Arizona started in Tiffin. So his mom took him to an antique store near Pioneer Mill restaurant, where they found two old hats. His mother bought the hats for him, but they needed repairs. “The antique guy said he had a couple hat blocks in the back,” Watson said. “He had a whole set of hat blocks, and those blocks were the prefect size. “Mom made an arrangement with me to do extra chores, and she bought them for me,” he said. So the 10-year-old Watson repaired his hats and began teaching himself the craft. He found books in Tiffin-Seneca Public Library and other sources. By this time, he was about 12 years old. Watson said he also did other things teenage boys do such as play sports and hang out with friends. But between ages 12 and 17, he learned to make hats by trial and error. At the time of his graduation from college in 2008-09, Watson said the country was going into a deep recession, and jobs were scarce. Through college he had been working as a suit salesman, but didn’t want to keep doing that forever. She was a bit surprised, he said, but said she’d support him in whatever he wanted to do as long as he helped pay the bills. In the beginning, he didn’t know if it would be a hobby, be a part-time business or full-time career. He called a few hat shops around the United States and visited them to learn more about making hats, and he told them he wanted to earn a living making hats. He and Emily moved to Arizona when she was hired as a professional pilot, and Watson continued to sell suits. “We were driving one day through Cave Creek,” Watson said. “It was summertime, which meant it was hot and there wasn’t much going on. We ended up passing this one place along the way that had a for-lease sign out front. As I drove past it, a voice in my head said turn around and go get that phone number. “Long story short, I talked to the landlord and he loved that I wanted to open a hat shop,” he said. 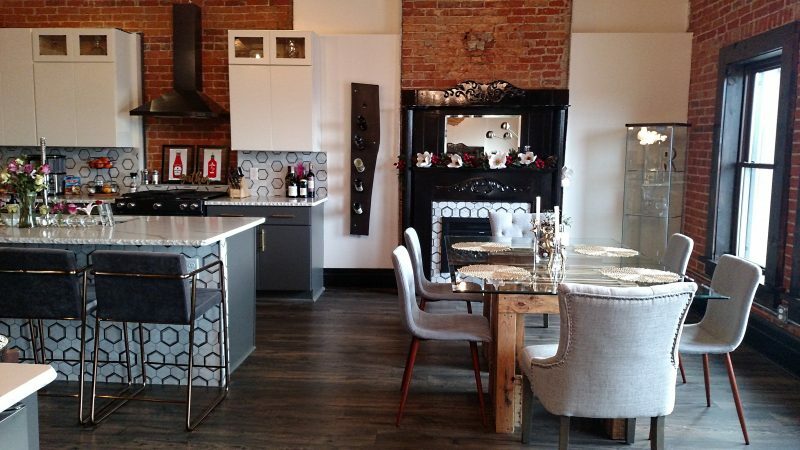 However, Watson could only afford half the rent on the 500-square-foot space. “So he rented me half of it,” he said. 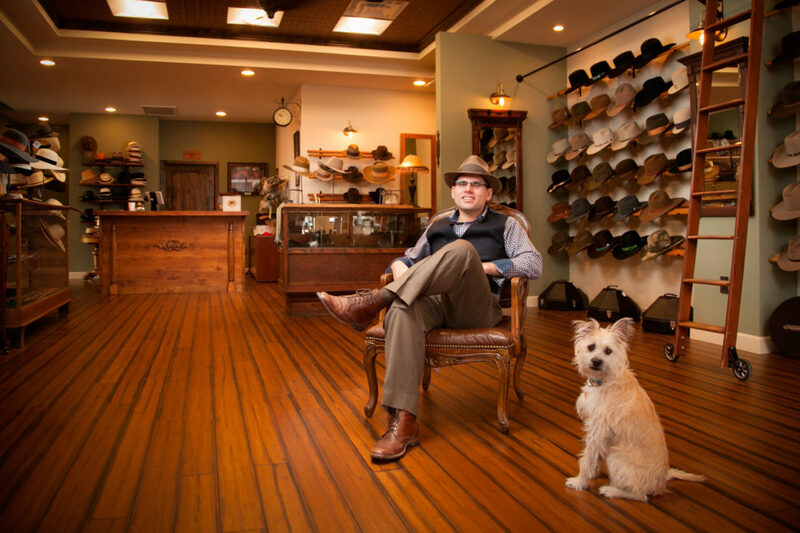 Watson’s Hat Shop was born in 250 square feet. “I had $500 in my pocket and a $1,500 loan,” he said. He got his website online and started business. He entered the shop, looked around and bought two custom hats, two hat boxes and two custom hat bands. “I took that as a sign from God that things are going to be OK,” he said. It didn’t take long before business had grown to where Watson needed the entire 500 square feet, but he still couldn’t afford the rent. He worked out an arrangement with the landlord and expanded. The following year, he added the unit next door and doubled the store’s size to 1,000 square feet, and then to 1,500. That’s when he found the store’s current location in Stagecoach Village, Cave Creek, Arizona. Watson said his new landlord believed in him enough to help him get his new shop, and he’s leasing it toward owning the space. Not only does he sell hats there, he makes them with equipment such as hat blocks and brim molds. Half of the space is for customers to choose from finished hats. Today, Watson makes cowboy hats, dress hats, Aussie hats, Panama hats, Heritage hats and ladies’ hats as well as custom hats to the customer’s specifications. The shop has 33 colors to choose from, and hundreds of hat bands made from materials such as horse hair, leather, silver, turquoise and hand-loomed Indian beads. He also restores, cleans and repairs hats. Prices for a new hat start at about $400, and go up based on material, finish and style. Watson said he’s learned there’s a lot of hard work involved in running a business and making a high-quality product. Customers entering the shop might notice a large picture of George Washington kneeling, he said. His wife got it for his birthday one year. Watson said his greatest moment of trepidation came when he discovered he would no longer have his suit-selling income, even part time. Opening the store limited the number of hours he was able to work and the store decided they would no longer need him at all. “That was probably one of the most anxious points,” he said. “It was a big risk,” he said. 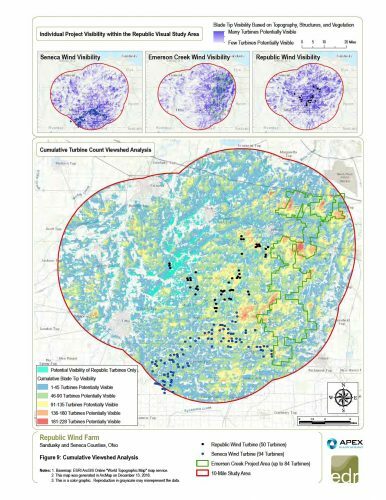 “It was a big undertaking to do everything that needed to be done. 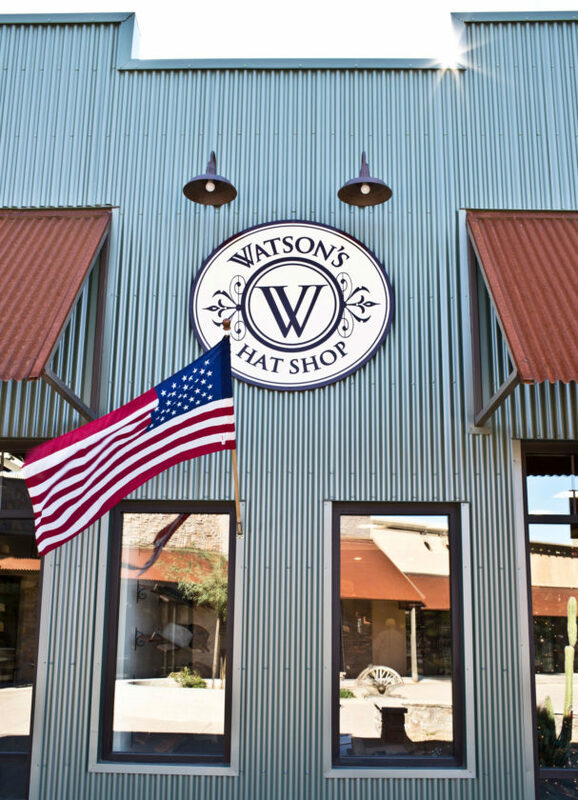 If you are planning a trip to Arizona and want to check out Watson’s hats, the shop address is Stagecoach Village, 7100 E. Cave Creek Road, Ste 148, Cave Creek, AZ 85331. Store hours are 10 a.m.-6:30 p.m. Tuesday through Saturday, and Sunday and Monday by appointment. Contact the store at (480) 595-9777 or info@watsonshatshop.com, or visit watsonshatshop.com.